A man has been arrested after a refuse collector travelling in a bin lorry died following a "horrific" crash with a heavy goods vehicle in Essex. The accident happened in Oliver Close in Grays at 07:45 GMT. The man, who was in his 30s, died at the scene. Two other people were taken to hospital with minor injuries. A 40-year-old from Grays was arrested on suspicion of causing death by dangerous driving and is currently being questioned by police. 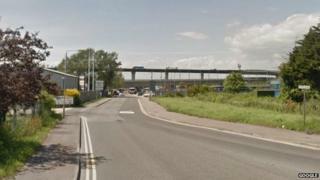 A Thurrock Council spokesman described the crash as a "tragic incident" and a "horrific event". Council leader John Kent said: "Our thoughts and prayers are with the families of those involved and we will do what we can to make sure they have all the help and support they need." Essex Police closed the road while forensic examinations took place. It was reopened shortly after 14:00.